All around the world men and woman are fighting on foreign soil, sacrificing their lives so that we here at home can have all the freedoms we so often take for granted. Take some time during this three day weekend to go out of your way to say thank you to those men and women (and their families) who so bravely and courageously give of themselves so that we can have a safer tomorrow. Take a minute, while you're driving to a holiday cookout or the pool, to stop by the cemetery and acknowledge the freshly placed American flags by grave markers, remembering what they represent. But most importantly, remember that freedom isn't free. 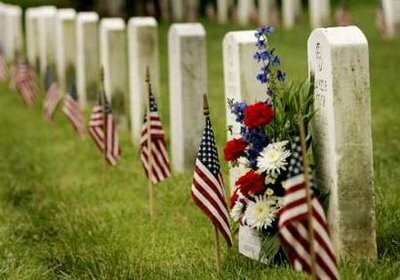 If you're looking for some further thoughts on this Memorial Day weekend, please stop by Rachel's blog. She just recently welcomed her husband home from an Iraq deployment. I watched the video and looked at pictures with tears streaming down my cheeks. Its a reminder that such amazing hero's are often every day citizens who courageously choose to serve when they are called.